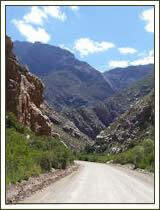 The poort itself - Author and poet C Louis Leipoldt called the Seweekspoort one of the "seven wonders" of the old Cape Colony. The magnificent vertical rockfolds, reaching for the skies on both sides of the road, reflect the inconceivable forces of the volcanic eruptions millions of years ago, forming the chain of Cape ripple-like mountains. Often the converging slopes leave only a narrow pass, whilst the precipices of naked, distorted rock-faces tower like walls of a natural rampart, obscuring the sun. Gamkapoort dam via the scenic Boschluyskloof. ( the dam was build in the late 1960 for the farmers near the Gamkariver in Calitzdorp. By finishing the dam the route to Prince Albert from here was closed. A wide range of birdlife an also be spotted. Cape pheasant, stork, Egyptian Goose, African Coot. Predatory birds like owls, black eagle and fish eagle. 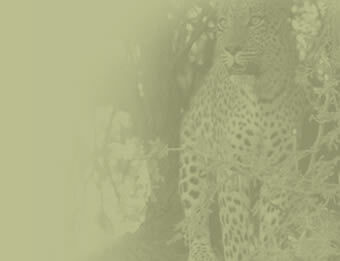 Other predators in the area like Leopard, Jackal, Lynx, and Cape Wild Cat. Other animals like Baboons, Rock Hare and Rock Rabbit is frequently seen. Get physical and go for a hike on the farm. Bring your mountain bike along. Cycle part of the route of the 7Weekspoort Mountain Bike Challenge that runs over a part of the farm. Stay up for stargazing. Clean, clear skies that you just want to reach out and touch. Laingsburg (70km) visit the Flood Museum and Dutch Reformed Church and see what happened to this little town on 25 January 1981. Laingsburg also have a golf course next to the Buffelsriver that washed the town almost away. Oudtshoorn (100km) - Cango Caves, Cango Wildlife Ranch with cheetahs, tigers, crocodiles, Safari Ostrich Show Farm, Wilgewandel for Camel rides.